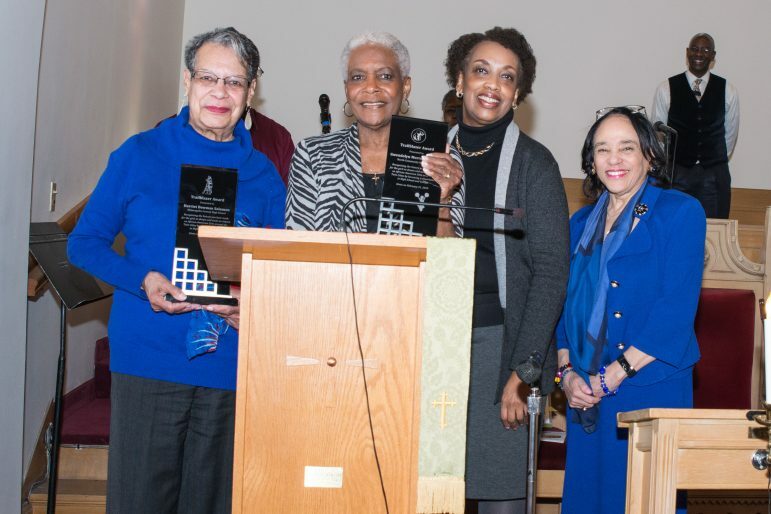 Submitted photo Two trailblazing cheerleaders were recognized at St. Peter’s Church in Minneapolis: (l-r) Harriet Bowman Solomon, Gwendolyn Morrow Fraction; Rev. Carla Mitchell, pastor of St. Peter’s; and former Minneapolis Public Schools.superintendent Dr. Carolyn Johnson. Few people realize that not only did women athletes cheerleading at sporting events originate right here in Minnesota, but several African American women made history here by breaking the cheerleading color barrier. Prior to 1923, cheerleading had been an exclusively White male activity. That year, the University of Minnesota (U of M) became the first school in America to allow female cheerleaders. It remained an all-White activity there, however, until Dana Purdue Williams became the first African American cheerleader at the U of M in 1975. Below are Williams’ story and two other earlier cheerleading firsts that inspired her to pursue her own dream. A 1950 Minneapolis North High School graduate, Fraction became in 1949 the first African American cheerleader in the state of Minnesota. Upon graduation, she worked for Northwestern Bell and in banking, insurance, and accounting. At age 85, Fraction still volunteers in the community and is known for her beautiful voice. Following in her mother’s footsteps, Fraction’s daughter Cindy became a cheerleader for Washburn High School, graduated in 1983, and is now program director of research at the University of St. Thomas. A 1951 Central High School graduate, Solomon watched her brothers play football and other extracurricular activities. Her brother Earl Wesley Bowman attended college on a football scholarship, played baseball at a major university, played semi-pro football, and became the first African American president of Minneapolis Community College. Her other brother, Henry Bowman, was a member of the Tuskegee Airmen as well as a Big 10 regional player. Harriet wanted to establish her own legacy and accomplished this through cheerleading. She was the first African American cheerleader at Minneapolis Central High in 1950 and later worked for Northenwestem Bell. After retirement in 1995, she volunteered at McRae Park. Edward C. Soloman Park near Lake Nokomis in Minneapolis was named after Harriet’s husband for his outstanding contribution to the Minneapolis park system as a board member and a volunteer at McRae Park. This 1975 Washburn High School graduate who went on to become the U of M’s first Black cheerleader, says that at an early age she watched her mother, Harriet Bowman Solomon, cheerleading in the kitchen, living room, or anywhere else where she had space and a chance. She also watched her best friend Gwendolyn Morrow Fraction doing the same, all while having fun. Williams recalls her mother enrolling her in ballet classes at the tender age of six. At age 10 she attended the Minnesota Dance Theater children’s workshop, where she became an apprentice and mastered the program by age 15. As Williams took her inspiration from predecessors Fraction and Solomon, so did she take their career advice, becoming a flight attendant for 40 years at Delta/Northwest Orient Airlines. She now works as an ambassador for Delta Airlines, visiting their headquarters in Atlanta, GA to inspire and motivate future flight attendants to be all that they can be for the customers and the company. Williams has also has been giving back to her community through the years by helping young inner-city girls and working with football camps at McRae Park in South Minneapolis. The most important thing in sports is not just the games and their players — it’s the fans and their enthusiasm that makes the games so wonderful. And who is it that gets the fans yelling themselves raw cheering on their teams to victory? That’s what the cheerleaders do, though rarely do they get credited for their athletic contributions to the sports world. Not so long ago, cheerleading was the only opportunity for girls to be seen and heard as athletes at their schools, colleges and universities. Before the Title IX federal civil rights law came into effect in 1973, girls did not have the same opportunities as boys to develop their skills in sports. The only thing they could do was to go out on that field and cheer on their team. Fraction, Solomon and Williams all made important strides for Black women athletes between 1949 and 1975. Thanks to them and many others like them, girls around the Twin Cities can now aspire not only to become cheerleaders in high school and their respective universities and colleges. Now they can aspire to compete as athletes in any sport that captures their dreams. Kenneth Foxworth is a contributing sports columnist at the Minnesota Spokesman-Recorder. He welcomes reader responses to kennethfoxworth568@msn.com. Wonderful article. I was a cheerleader in my high school and it would not have been possible if these sister did not pave the way! Thanks Ken. 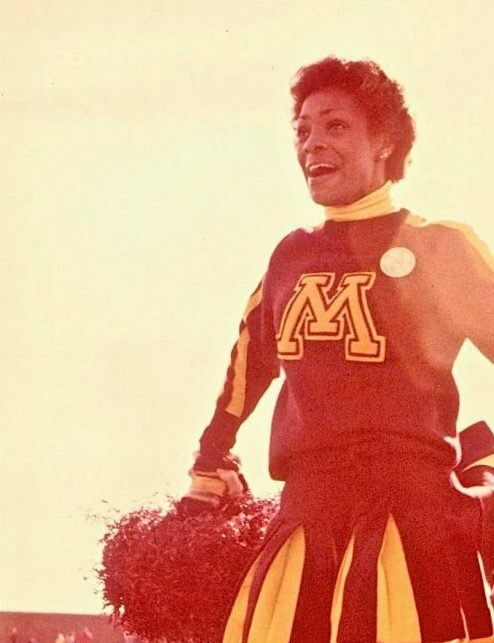 Vernetta Baldez, my room mate at the University of Minnesota was the FIRST Black cheerleader at the University in 1970…I have pictures of her in her cheerleading uniform. Vernetta married U of M Gopher Football star Ray Parsons following her one year as a cheerleader and they had one son after he was drafted by the Detroit Lions. Just want to let you know that Macalester college also had black female cheerleaders during the late sixties.